On the plus side of all this, breastfeeding is commonly practiced in Japan, and many places are breastfeeding-friendly (particularly department stores, as they often have nursing rooms), but it's still largely unexplored territory for me. It helps to read the experiences and knowledge of others, so if you have an experience to share, I'd love to hear it. 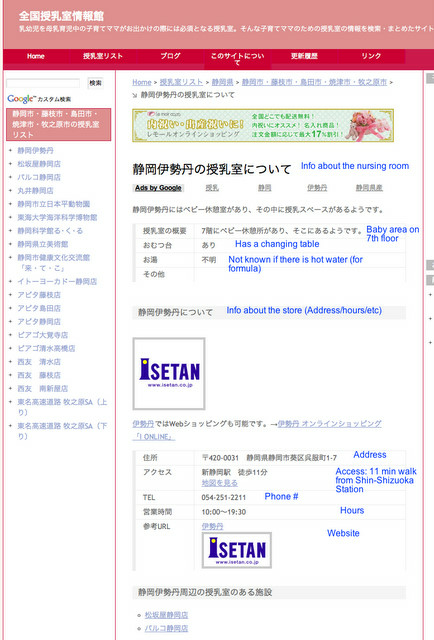 So, in my anxiousness figuring out this whole nursing thing while going out, I was curious if I could find any specific information on breastfeeding-friendly places in Japan, and lo and behold, I came across a couple independently-maintained sites with databases of places all over Japan that have a breastfeeding or baby room of some sort. The sites are all in Japanese, but for those who can't read it, I've made a quick guide below for how to navigate and understand them. As long as you know the kanji for the place you are going to, it's not so difficult. (And if you don't know the kanji, it helps to check the names on Google maps, since they show up in Romaji and then have the kanji underneath the name, or else just do an internet search and somewhere you should be able to find the kanji). Also, these nursing rooms are helpful even if you're using formula, as many of them have hot water machines. That aside, they also usually have diaper changing stations. Good to know whether you're breast or bottle feeding your little one. 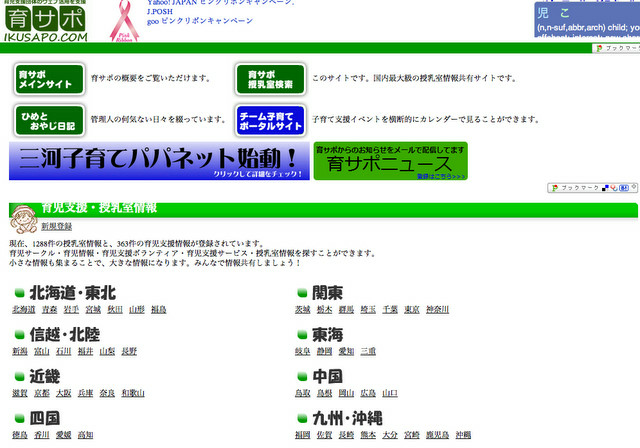 The first site is Ikusapo (育サポ), short for childcare support. The second site is nursing-room.com. Much of the information on both is reader-submitted as well, so they encourage people to share their knowledge. As a result of this though, neither site is completely comprehensive (some prefectures have next to nothing listed, while others have a lot more), but they are decent resources, particularly for some prefectures. 1. Go to Ikusapo's website, as shown below. 2. Find the region you are headed to or want info about, as shown in the picture below (translations for regions provided). 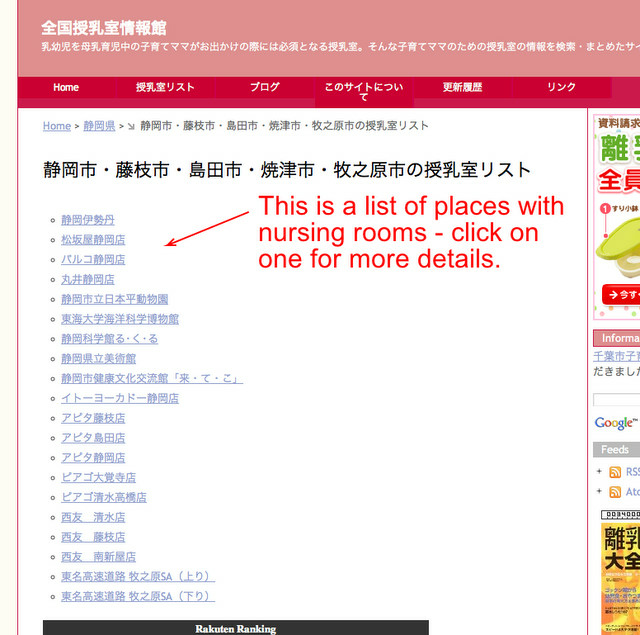 Then click on the desired prefecture. 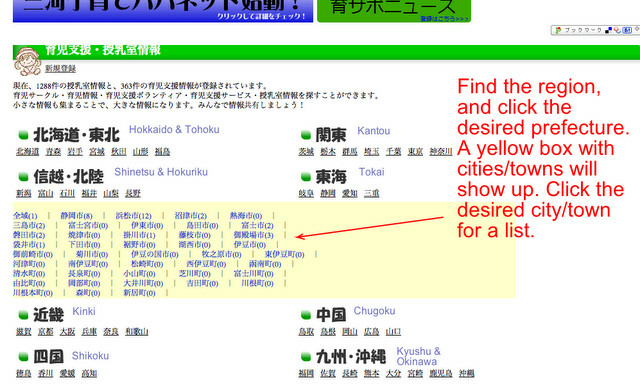 A yellow box will show up with a list of cities/towns. Click your desired city or town. If the white boxes with gray outlines are red and have the kanji 有 or a number, it usually means they have whatever that particular item/thing is (the number typically means how many of that thing). If they are light gray and say 無, it usually means they don't have it, and if dark gray with 不明, then unknown. If you're up to it, you can go in and make changes to entries if you've noticed something has changed, as you would on sites like Wikipedia. 1. Go to this page. 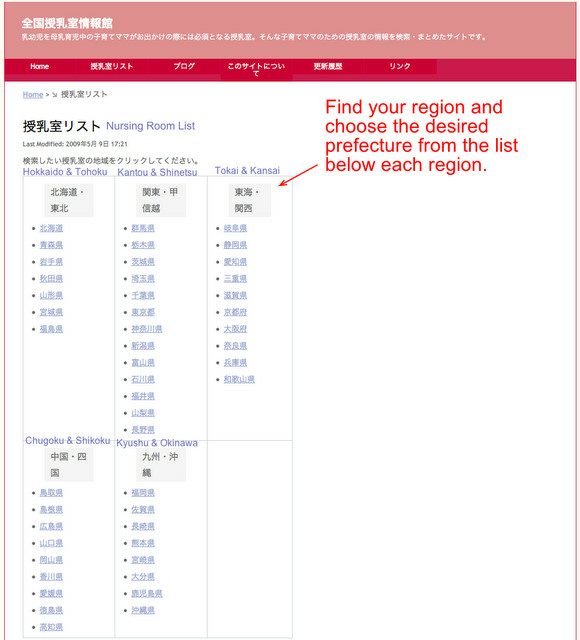 Then find your region and choose your desired prefecture from the list. 2. Choose your desired city or area in that particular prefecture. 3. The next page to show up reveals a list of places with nursing rooms. Click on any for more details. 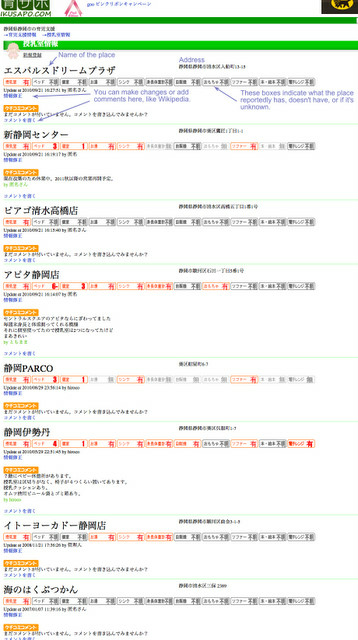 The following image shows results for five cities in Shizuoka prefecture. So I can look for the city I want within the names; for example, if I want to find one in Shizuoka city, I would look for 静岡店 (Shizuoka store). 4. The location details will tell you what the place has/doesn't have, and the address and contact info is usually listed at the bottom. Note that some stores will have very little information while others will be more extensive. Use the words to know list above to help decipher the results. You can see in the image below that this location has a changing table (おむつ台) and hot water (お湯) in the nursing/baby area. That's it. You can easily copy and paste the address into Google maps or the virtual map of your choice to figure out exactly how to get there. Another great resource for finding breastfeeding places in Japan is Milpas, a nursing room locator app. Moms (or dads), do you have any additional tips for breastfeeding/nursing while out and about in Japan? If you found this post helpful, you may also be interested in checking out the Pregnant in Japan and Giving Birth in Japan series. Q&A: How to find a hair diffuser? Surviving in Japan is now on Google+! Q&A: How to avoid Sodium Lauryl Sulfate?